“…knowing God was changing my assignment from being on staff at Elevation Church to something new and different was honestly terrifying. Not knowing what’s next and stepping out in faith can be terrifying for all of us, but we serve a good God, a big God who doesn’t leave us or forsake us. I’m learning that it’s far more terrifying to not walk in obedience than it is to take that step into the unknown. This album has helped me with that journey. The songs on this project have been reminders to me of God’s faithfulness and of His never-ending love for us. I hope that listeners find the same encouragement as I have in this season…” Recently signed to Capitol Christian Music Group, former Elevation Worship frontman Mack Brock, who served as music producer of Elevation Group as well (for more than a decade); has decided to step out on his own to record his debut full length solo album Greater Things; which released this past week. Venturing out into the great unknown to launch a solo career, one might surmise that perhaps there were disagreements between Mack and the rest of Elevation Worship- why would bands break up otherwise? Yet God could be calling each member to different areas, and one listen from the title track of Greater Things and the other 8 remaining worship anthems; and you’ll be convinced that Jesus still has something fantastic and wonderful for Mack to accomplish in the world of music in the coming years, as he brings more and more into the Kingdom of God through the gifts He has given to him. With the lead single, the title track already being released since February this year, the melody reminds me of Elevation Worship in style, as Mack delivers to us a slower-paced, keys-led ballad, which slowly but surely builds and builds to turn into an epic anthemic electronic dance party. Mack certainly is right at home vocally, and this track is bursting with energy and celebratory joy! Ardently declaring that ‘…I will not fear for You are with me, I’ve seen this fight from the victory, no power of hell could stand against me…’, Mack eloquently highlights the fact that it is Jesus and only Jesus whom we can always trust, and trust to do greater things than we can ever imagine. One of my favourite worship songs of 2018, “Greater Things” is something that needs to be heard and experienced, by anyone who needs motivation and uplifting, or just anyone who wants to worship our Lord God the Almighty. Destined to be big on radio this year, I am positive that the track will propel Mack to greater heights and get his name out there as a songwriter, worship leader and solo artist! The rest of the album showcases a young man of God on fire for Jesus, passionate about his faith and overtly sharing the gospel through song- a mission God is still calling him to do even as a solo artist. “Christ Is Risen”, an out and out worship anthem, albeit with a sprinkling of electronics and remix effects for added musical depth, is co-written with Phil Wickham (and also recorded by him on Living Hope) and thematically basically carries the same message as Matt Maher’s song of the same name- that Jesus Christ is risen from the grave, therefore we can with confidence proclaim that He is Lord and King over our lives, because He is risen and alive in us. A personal standout on such an already musically and lyrically strong album, “Christ Is Risen” is a song that will probably find its way into churches everywhere on Sunday morning services in the near future. Mack then experiments with heavy distortion, autotune and electronics, as “Heart Wide Open” is a track that earnestly cries out that ‘…I’m gonna worship with my heart wide open, I don’t wanna miss a thing, ’cause You take what was broken and make it new, I’m gonna trust You…with my heart wide open…’, with Mack fervently reiterating to us that he’s going to come to God without any preconceived ideas of what God will do- instead with a willing heart and an open mind; while the tempo drastically lowers for the reflective, subdued, and comforting piano led ballad “Into Dust”, which was co-written with Jesse Reeves and Ed Cash, as Mack prayerfully highlights the notion that Jesus created us from dust, and because of His power, we can declare His sovereignty and praise Him for who He is. Celebration and joy are the cornerstone of the next few tracks, as “God Of Breakthrough” is an anthemic synth and guitar led worshipful melody, as Mack eloquently cries out that Jesus is a God of breakthrough, and that He will make a way as ‘…only You can…’; while Mack collaborates once again, this time with Jordan Frye and Brenton Brown for a hymn-like keys and electronics led “Fresh Wind Fresh Fire”, praying for revival, for the Holy Spirit to invade our hearts so that we can be more like our Father in heaven. Greater Things ends with the reverent, insightful, haunting and mysterious piano led 7-minute-long “To the End”, with Amanda Cook on guest vocals, where Mack fittingly ends the album the way it began- with unbridled and unrestrained worship, praising Jesus because He is faithful in all circumstances, at all times, and until the end. With Elevation Worship’s smash hit “Do It Again” becoming an unexpected runaway hit this year in Christian radio, Mack covers the melody that he himself had a hand in writing (along with Chris Brown, Steven Furtick and Matt Redman), with Rita Springer on guest vocals. While the original version from Elevation Worship was driven by stirring keys and explosive guitars, this mid-tempo ballad is more laid back and acoustic, as it still gently reminds us that Jesus has won the battle once, and that He can do it again. A declaration of promise and assurance that ‘…Your promise still stands, great is Your faithfulness, faithfulness, I’m still in Your hands, this is my confidence, You’ve never failed me yet…’; we are presented with an anthem for the ages, and one that we can proclaim and sing out, especially in times of trouble to remember that Jesus is ever working, all the time, even if we do not always see the effects immediately. 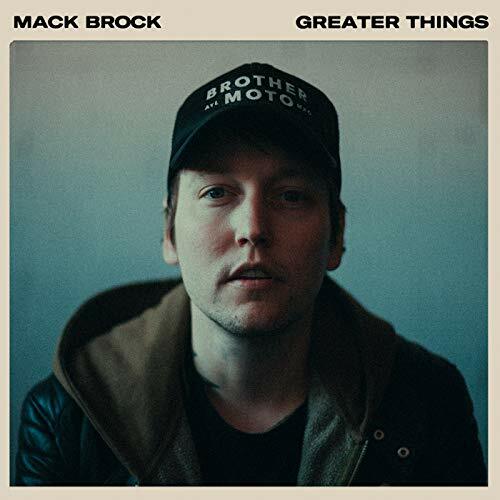 Easily accessible and able to be used as a worship melody in church, Mack Brock has shown us in this song especially how lyrically proficient he is as a writer, as he presents us with a vibrant, relatable and relevant song that is as honest, personal and emotional in many different formats. Yet it is “One Like Us”, the unexpected yet refreshing worship duet with KB, that has caught me from left field, and is THE track from the album- the one that shows us that worship music does still have life, and can be married with other genres without diminishing its effectiveness. As Mack vibrantly and emotionally expresses his thanksgiving to God because He became one of us when He came as a baby and later on started his ministry; the heartfelt and emotional account of Jesus making us new and whole; we are blessed to hear such an exquisite recording, and a melody that I’m sure will catch on, either at radio or in churches very soon. With KB seamlessly adding his rap to Mack’s inspiring melody and lyrics, “One Like Us” reminds us that Mack Brock has more to give musically and lyrically, and that his time as a solo artist is sure to inspire people and draw us all deeper and deeper into Jesus. With Elevation Worship still going strong, and Mack Brock seemingly fitting right into the ‘solo artist set-up’, this could be a win-win situation for everyone, as Greater Things reminds us that there is something great happening soon that is waiting on the horizon for us. As Mack preps for the Heaven fall tour with Mosiac MSC and Cody Carnes, I reckon this album is sure to be in one of my top ‘favourite albums’ come the end of 2018. So, what are you guys waiting for? Listen to Greater Things, then listen some more! Let me tell you, you will be blown away! Yeah probably… if it becomes a single which if it did would most likely be rerecorded without KB and shortened in length to around 4 min. In all honesty knowing WOW I wouldn’t be surprised if Greater Things makes it next year. But, yeah, Greater Things might make it next year, so good point!